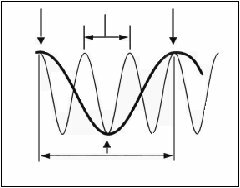 Aliasing is the term used to describe the unwanted frequencies which are produced when a sound is sampled at a rate which is less than twice the frequency of the highest frequency component in the sound. These unwanted frequencies are typically high frequency tweets and whistles. Fig. 1 Sound with a frequency of 1500 Hz sampled at 1000 Hz. Sample points are not enough to accurately represent the wave form. What is the highest frequency that could be sampled with a sampling rate of 11.025 kHz?